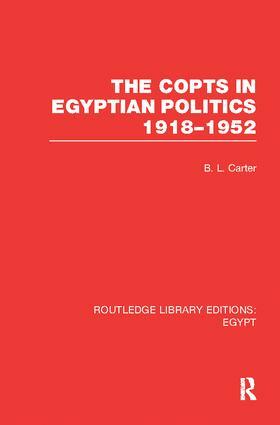 This book explores the political relationship between the Muslim majority and Coptic minority in Egypt between 1918 and 1952. Many Egyptians hoped to see the collaboration of the 1919 revolution spur the creation of both a new collective Egyptian identity and a state without religious bias. Traditional ways of governing, however, were not so easily cast aside. Some Egyptians held tenaciously to the traditional arrangements which had both guaranteed Muslim primacy and served relatively well to protect the Copts and afford them some autonomy. Differences within the Coptic community over the wisdom of trusting the genuineness and durability of Muslim support for equality were accentuated by a protracted struggle between reforming laymen and conservative clergy for control of the community. The unwillingness of all parties to compromise hampered the ability of the community both to determine and to defend its interests. The Copts met with modest success in their attempt to become full Egyptian citizens. Their influence in the Wafd, the pre-eminent political party, was very strong prior to and in the early years of the constitutional monarchy, and their formal representation was generally adequate and, in some parliaments, better than adequate. However, this very success produced a backlash which caused many Copts to believe, by the 1940s, that the experiment had failed: political activity has become fraught with risk for them. At the close of the monarchy, equality and shared power seemed motions as distant as in the disheartening years before the 1919 revolution.